Mahou Sensei Negima! is a manga by Akamatsu Ken which has had an anime and live action adaptation of the same name. There is also another manga called Negima!? Neo by Fujima Takuya which was made into an anime titled Negima!?. Wikipedia says that Fujima is the author and Akamatsu merely provided guidance. MAL, however, credits Akamatsu as a story author (along with Fujima). Is there any official statement on Akamatsu's role in Negima!? Neo? I mostly want to know if he played a major role in its creation or just basically made sure Fujima didn't completely ruin his series and/or its' reputation. I'd say that the info on MAL's page would be the accurate one. You can see in Amazon's page for the first volume of Negima!? Neo, that both the information on the authors (right under the title) and the cover state that the story is by Akamatsu Ken and that Fujima Takuya is the illustrator. 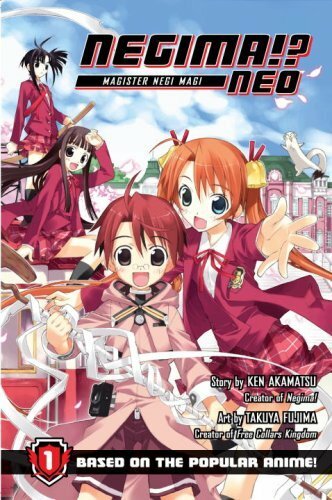 Also, Amazon.co.jp's page on Negima! ?Neo too states Akamatsu Ken as the author (赤松 健 appears under the title followed by the kanji 著, which means author). Not the answer you're looking for? Browse other questions tagged mangaka negima ken-akamatsu or ask your own question. What manga is Ken Akamatsu currently working on? What are some of Masamune Shirow's most recent works?